They called it Meltdown Monday, and it turned the financial world upside down. The stock market tanked huge. People all over the world who know stuff about money freaked out. Lots of people lost their jobs. Talking heads are still arguing about what happened, why it happened, and who’s fault it was. Beyond that, we tend to think our lives would be way better if we had a lot more money. Here’s the problem: Money fails. Even if you have plenty of it, it will always let you down. For the next few days, Solomon will tell us all the ways in which money can break our hearts. Think: What does the verse above say about money? What does it mean that God is rich? What does “all your needs” mean? Pray: Thank God that He is ultimately the one who meets your needs, not yourself or money or work. Do: Read Philippians 4:19 (above) as many times as necessary to get it good and stuck in your head. King Solomon of Israel may have been the richest man who ever lived. He was also the wisest. In Ecclesiastes 5, he combines those two to describe all the ways in which money fails to truly satisfy anyone. He starts with the problems of injustice and taxes. During this last campaign season, you heard candidates and political ads saying all kinds of things about poor people and taxes. No matter who won in your country or state or district, one thing won’t change: Making more money always means paying more taxes — even in countries where it leaves the people starving. Money fails to satisfy because every level of government takes a bite — city, county, state, national. The intent in many countries is to use that money for the common good, but lots of it gets wasted along the way and people get hurt. No matter the century or the form of government, the more you make the more they take. Think: Taxes aren’t always evil; they’re just one of the burdens that come with having money. What are some of the others? Pray: Thank God that He provides for all of our needs, including the need to pay the taxes we owe. Do: Ask someone who has a lot more money than you how they feel about paying taxes. Guess what? This verse is about that person. And you. And me. Any time we connect the words “dollars more” with the idea of “that would be enough,” we’ve become that person. We’re the gerbil in your second grade classroom who never gets to the end of that wheel no matter how long he runs. The chase for a “few dollars more” is a race without a finish line. “Rich enough” doesn’t exist in this world. And that’s coming from the richest guy who ever lived. Think: Why do people love money? Do you really believe you could never have enough of it to make you satisfied? If money won’t do it, what will bring you satisfaction in life? Pray: Ask God for the courage to start believing this verse now and to keep believing it when you start to think you’d be satisfied with just a few dollars more. Do: Write a quick list of 5 material things you’ve thought would make you happy that you eventually got. Put a check next to the ones that still make you happy. Solomon continues to describe the ways in which money fails to satisfy us. Now he points out how expensive it is to own stuff. The more you have, the more people you need to take care of it all. Solomon had to feed and clothe an army of servants to take care of his more and more stuff. We do the same. We just call them repair shops and gas stations and insurance agents and cleaners and battery manufacturers and then back to the original seller when its time to replace the old stuff. The more we make, the more money we need to keep paying all the people to keep our stuff in good shape. And rich guy Solomon envies some of those servants a little. At least they can get a good night’s sleep, he thinks. He lies awake worrying about the best way to take care of all his money and his stuff. Having money costs more money, more time, more energy, and more sleep. Think: Have you ever thought about all the stress that comes with having a lot of money or a lot of stuff? Do you think that would make anyone NOT want to have as much money? Pray: Ask God to give you a healthy attitude toward money and the stuff money can buy so you can avoid being owned by your stuff. Do: As an example, compare how much it costs to buy a car with how much it costs every year in gas, insurance, maintenance, repairs, etc., to keep that car running. Money is a lousy provider. You just can’t trust it. You work hard to earn some of it, and then an unexpected expense comes along and takes it all away. That didn’t happen to Solomon, but he saw it in the lives of his people. One famous example involves a woman in the 1800s who had millions but died from malnutrition in a freezing apartment because she couldn’t stand to part with any dollars. People do foolish things when they start to believe that having money is the key to being safe, secure, and happy. Think: Most people tend to either spend money foolishly or hold on to it too tightly. Does one of those describe you? What do both weaknesses reveal about our faith in money and our faith in God? 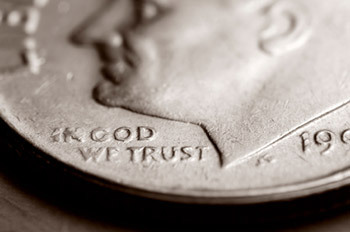 Pray: Ask God to help you not to put your faith in money, but to trust Him instead. Ask Him to help you to earn it, save it, give it, and spend it wisely. Do: Listen this week for examples of people who lost a lot of money unexpectedly. Solomon makes his final point in the case against money’s ability to satisfy us. We’ve already seen that money gets confiscated by the government, that the thrill of getting it is always temporary, that it is surprisingly expensive to have money, and that money is fickle. But Solomon’s darkest words are in these verses. To paraphrase a popular saying, “The person who dies with the most money . . . is dead.” A lifetime spent piling it up gains you nothing because there’s no way to forward the cash to the afterlife. There are no ATMs in heaven (or hell). You start with zero and end with zero; how much does it really matter the number of dollars you had in between? What is money worth if you’ve got to leave your debit card at the door to the next life? Think: We’ve heard Solomon’s case against relying on money to give our lives meaning. What are some things that money is good for? Pray: Ask God to give you the courage not to trust money or to believe that it can ever take care of your deepest needs. Ask Him to help you to always trust Him above all else. Do: Read 1 Timothy 6:17-19 and notice how money can be used to invest in the next life. Money Week: Give Up! Enjoy! After deciding that money is worthless in bringing any real satisfaction to life, Solomon reached a head-spinning conclusion: Enjoy the moment! After all his dark words about dying naked and broke, I did not see that coming. Here’s the gist: Relax. Quit trying to win at life like it’s a competition. Quit trying to master it like it’s a test. Quit trying to solve it like it’s a riddle hiding the secret to total, blissed-out satisfaction, perfection, and the end of that groaning empty feeling that plays like white noise from the back room of your soul. As Paul would say thousands of years later, that feeling you’re looking for is called heaven, being face-to-face with our Father God forever. That feeling is NOT hiding somewhere in this life waiting to be discovered in pleasure, money, or performance. And if you keep killing yourself to find it, you’re going to miss out on a million glad gifts today: great food, good friends, even the satisfaction that comes from doing your lousy job really well. Think: Does Solomon’s conclusion surprise you? Does it sound too easy? Can we really just relax and enjoy today as a gift from God — or will most of us have to learn that hard way that all of our searches for meaning outside of forever with God will end in frustration? Pray: Ask God to give you the courage to enjoy your food and work and play today as a gift from Him. Do: Read Romans 8:22-25 to notice Paul’s take on what will finally quench the inner groaning of our souls. Romans 13:1-7: Who's in Charge? 1 Peter 1:13-25: Who Are You? 1 Peter 3:8-18: Hurting for Good? Various Passages: Peace Week 2! © 2019 the daily devo. All Rights Reserved.